In a large skillet, cook beef and sausage over medium heat until no longer pink; drain. Add the tomato sauce, tomato paste, garlic, sugar, seasoning, salt, and pepper. Bring to a boil. Reduce heat; simmer, uncovered for 1 hour. Stir occasionally to avoid sticking. In a large bowl, combine eggs and parsley. Stir in the cottage cheese, ricotta and Parmesan cheese. 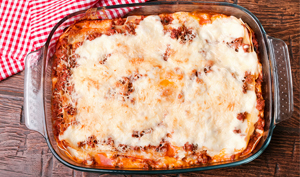 Spread 1 cup of meat sauce in an ungreased 13-inch by 19-inch baking dish. Layer three noodles, provolone cheese, 2 cups cottage cheese mixture, 1 cup mozzarella, three noodles, 2 cups meat sauce, remaining cottage cheese mixture and 1 cup mozzarella. Top with the remaining noodles, meat sauce and mozzarella cheese. At this point, your dish should be full. Cover and bake at 375° for 50 minutes. Uncover; bake 20 minutes longer or until heated through. Let stand for 15 minutes before cutting.